In an effort to reduce the Kuala Lumpur buses travel time to Kuala Lumpur, the Ministry of Transport had launched the Bus Expressway Transit or BET that goes to Pasar Seni from selected towns of Klang Valley. The duration of travel to the city is shortened by using expressways and hence more commuters will be able to take buses to work. This programme was launched under the Government Transformation Programme or GTP that strives to improve urban public transport where the buses will use highways or expressways to link heavily populated areas and the city centre instead of the normal congested trunk roads. There are currently nine BETs in operations. These buses use expressways such as KESAS, Kerinchi – Penchala Link, NPE and PLUS to shorten the time taken to reach Kuala Lumpur. Almost all the buses stop at Pasar Seni where you can proceed to your next destination by taking LRT, taxi or other buses. To cater for the working people, the buses start from 6:30am and 7:00am. The journey back from Pasar Seni starts from 5:30pm and 6:00pm. For further information of the schedule, call RapidKL Helpline at Tel: +6 03 7885 2585 from 7am to 8:30pm (Monday-Friday) and 8:30am to 5:30pm (Sat-Sunday). BET 1 serves the Kota Damansara - Pasar Seni route. BET 2 serves the Bandar Sungai Long - Pasar Seni route. BET 3 serves the Subang Mewah - Pasar Seni route. BET 4 serves the Taman Sri Muda - Pasar Seni route. BET 5 serves Bandar Tasik Puteri - Medan Pasar route. BET 6 serves the Bukit Beruntung- Pasar Seni route. BET 7 serves the Sri Nilam - Munshi Abdullah route. BET 8 serves the Semenyih Senral - Pasar Seni route. BET 9 serves the Rawang - Pasar Seni route. 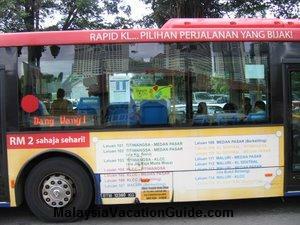 The one-way fare range from RM3 to RM4 which is the cheapest mode of travel to the city. The Ministry of Transport will be adding more routes in phases. 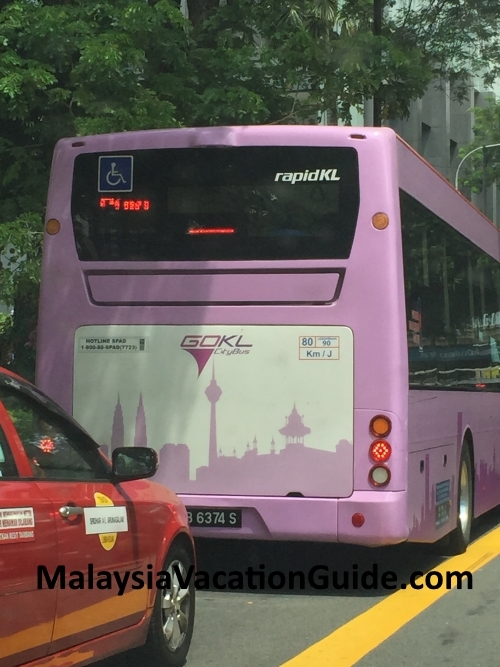 As part of the effort by the government to improve the public transportation in Kuala Lumpur, you can now take the FREE Kuala Lumpur Buses known as Go KL City Free Bus Service that ply the major routes in this busy capital city. This service has been in operation since 31 Aug 2012. No fare is charged for this service. Currently, there are four lines known as GREEN LINE, PURPLE LINE, RED LINE and BLUE LINE. Operating hours of the buses are: Mon to Thurs: 6am to 11pm. Friday to Sat: 6am to 1am. The frequency of the buses are 5 minutes during peak hours from 7am to 9am and 4pm to 8pm. Every 10 minutes during non-peak hours from 6am to 7am and 9am to 4pm. Every 15 minutes during normal hours from 8pm to 11pm/1am. 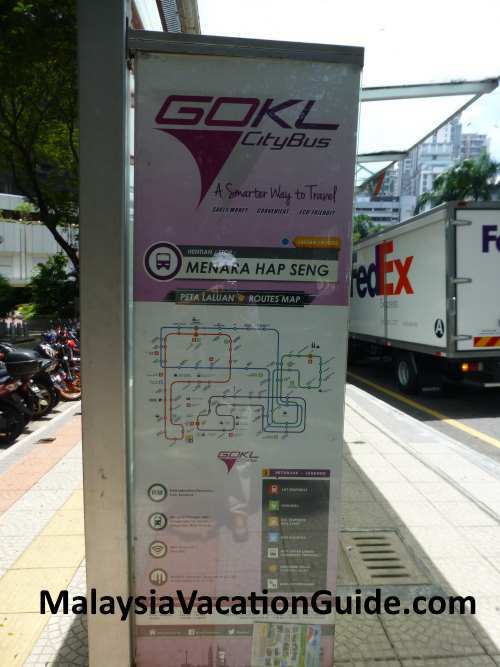 Look out for the GOKL CityBus, hop into this bus and you will be on the move to your destination. Check which line you should take by looking at the station nearest to your destination. The GREEN LINE Kuala Lumpur buses that ply KLCC-Bukit Bintang routes can be taken from any of the following 14 bus stops. 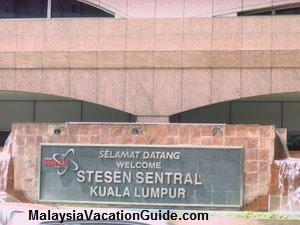 KL City Centre where the Petronas Twin Towers are located. LRT station is located here too. MATIC or Malaysia Tourism Information Centre where you can get brochures and assistance before embarking on your tour of Malaysia. Concorde Hotel. Monorail can be taken here as well. Pavillion is a must if you are into shopping. Bukit Bintang is the main shopping area of Kuala Lumpur. You can take the monorail from here too. The PURPLE LINE buses that ply Pasar Seni-Bukit Bintang routes from any of the following 15 bus stops. Pasar Seni Hub where the LRT train station is located. Telecommunication Museum shows the early telecommunication history of Malaysia. KL Tower is one of the main attractions in the city. Kotaraya where Pudu Sentral and LRT station are located. Take note that the GREEN and PURPLE lines overlaps at Pavilion, Starhill Gallery and Bukit Bintang. The RED LINE buses ply Kuala Lumpur Sentral-Jalan Tun Razak Bus Terminal routes from any of the following 21 bus stops. The BLUE LINE buses ply Jalan Tun Razak Bus Terminal-Bukit Bintang routes from any of the following 20 bus stops. The RED LINE and BLUE LINE overlaps at Terminal Jalan Tun Razak, Medan MARA, Puteri Park, Chow Kit(Jalan Ipoh) and Grand Season. See the detailed route of the buses here.